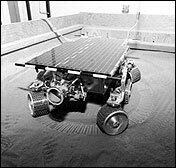 The last, and most important function of the Wheel Assembly is its ability to steer the Rover. Probably the most distinctive aspect of an exploration Rover is the way it steers and maneuvers across uneven and rocky terrain. Most Rovers have six wheels, of these four are used for steering. located on each corner of the Rover, the pivoting wheel assemblies are able to turn through 45° of movement. The design of the pivot assembly calls for some more large turntables, Liftarms and careful consideration of wheel placement, and width. In order to have the wheel assembly successfully pivot, (with the least amount of resistance), the wheel must be directly centered under the pivot axis. Alignment offsets, and wheel width increase resistance, therefore increase the amount of force required to turn the assembly. Fortunately a simple combination of Liftarms gives both the motor, wheel, and pivot turntable the right spatial relationship. Pending sufficient drive from the motor this configuration can also accommodate various diameter wheels with varying offset. A single pivoting wheel assembly is not much use by its self, but when you have four, all sorts of maneuvers are possible. 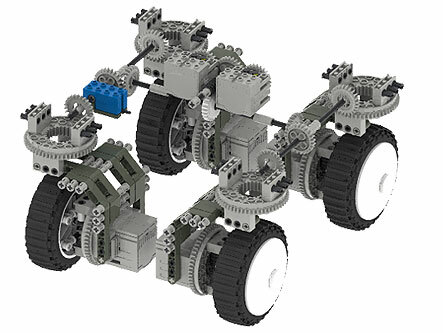 The key to Rover movement is the coordination of movement between all wheel assemblies. This task is coordinated by the Rovers electronic brain (the RCX in our case) and implemented through gearing and motors located within each wheel assembly. For simple forward or reverse travel, all wheels are parallel, and are driven in the same direction  quite straight forward (no pun intended). Forward (or reverse) movement is stopped. The outermost wheels are pivoted through 45°. 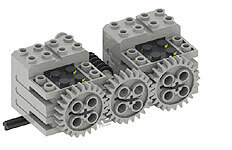 Diagonally opposite wheels are rotated in the same direction. Wheels on either side turned in the opposing direction causing the Rover to pivot. 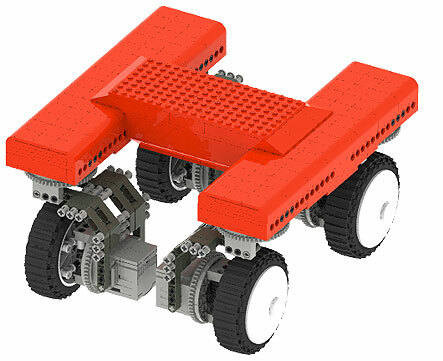 The longer the wheels are left to turn the more the Rover pivots. A short duration results in a small change of direction. A long duration will see the Rover pivot through 360°. Forward (or reverse) movement is resumed. Wheels assemblies only pivot through 45°. Wheel assemblies are controlled in alternating pairs. As illustrated earlier each wheel has a drive assembly that holds a motor. The motor requires power to run, and cables have to be routed from the RXC to the motor through the steering assembly (large Technic turntable). Because the wheel assembly will only ever be traveling through 45° it is more than safe to route the cables through the turntable to the motor below without a danger of them getting twisted or tangled. Because the timing and coordination of pivoting the wheel assemblies is critical, each wheel assembly is mechanically linked by a drive train. 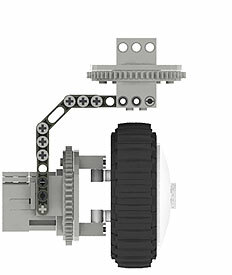 The drive train is configured to link diagonally opposite wheel assemblies, rotating them (opposite pairs) in unison. 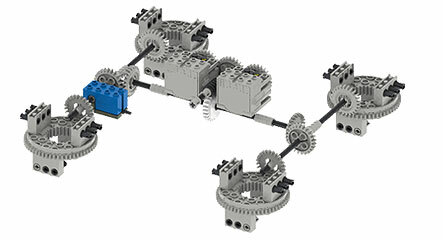 A 24t Crown gear drives the outer ring of the steering assembly turntable, while drive is supplied by 2x linked LEGO® 9V Geared motors. A 24t Clutch gear is mounted below the Worm gear to protect the motors from any mechanical jams along the steering drive train if they occur. The RXC uses a rotation sensor to monitor the turning process, and control the mechanically linked motors. The gearing of the steering drive train is such that it takes approximately 2 seconds to move the wheel assemblies through 45°. 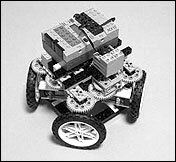 YogiCubs chassis is square, with each wheel assembly placed at a corner. This means the pivot point of each wheel assembly turns on a tangent to a common circle. This means when the Rover rotates through a steering sequence there is no scrubbing of the wheels  reducing resistance. Both steering motors are centrally located within the Rover keeping it balanced when on the move. 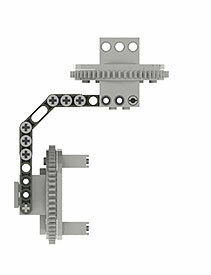 The steering drive train and complete wheel assemblies work in unison to provide consistent, and controllable steering. 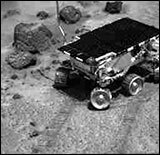 From the first Rocky Rover through Sojourner (Top) to the FIDO Rover (Bottom) 4-Wheel independent steering has been used to steer and direct Rover movement. Robert Stehliks Rover has 4 wheel drive and steering. 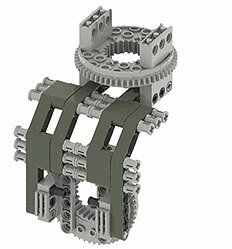 Drive to each wheel is achieved through a 40t gear and a universal joint. All four wheels are tangent to a common circle to avid scrubbing while turning. Joe Nagata has a new MOC which uses 4 wheels, 3 motors and an RCX. See Sojourner in action on Mars! This movie contains a compilation of image sequences taken by the Mars Pathfinder Lander. It is a great illustration of the unique steering technique employed by Rovers. It is interesting to compare the 'turning styles' of Rovers. The following movie compares Sojourner, Rocky 7, MER and YogiCub's turing characteristics while performing a simple steering sequence. 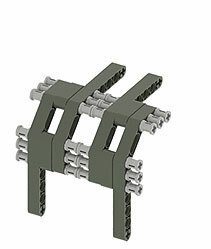 YogiCub has a common mechanical linkage which turns all pivoting wheel assemblies. 24t Crown gear driving a 56t turntable outer ring.